On 21st November 2016, more than 150 children and parents from our eight Outreach schools visited The Bach Choir for an after-school singalong of Christmas carols and festive favourites. Following a brief rehearsal, the children, their parents and teachers, and The Bach Choir processed from the rehearsal room in Westminster Cathedral Hall onto the Piazza in front of the cathedral to sing an informal performance for passers by. Despite heavy rainfall through the day, the skies cleared long enough for a dry performance. The large group of singers caused quite a crowd of onlookers as commuters stopped to watch on their way to Victoria Station. 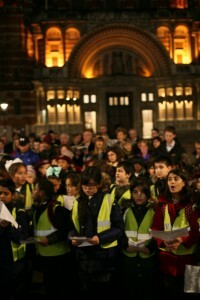 Children, parents, and Choir members alike thoroughly enjoyed the experience of singing in the open-air to a public “audience”.